Our oldest dog, Zoe, turns 15 July 30th. If she makes it that long. That’s her up above, a few months ago. Zoe was called ‘Trilingual’ in the newspaper ad where I found her. 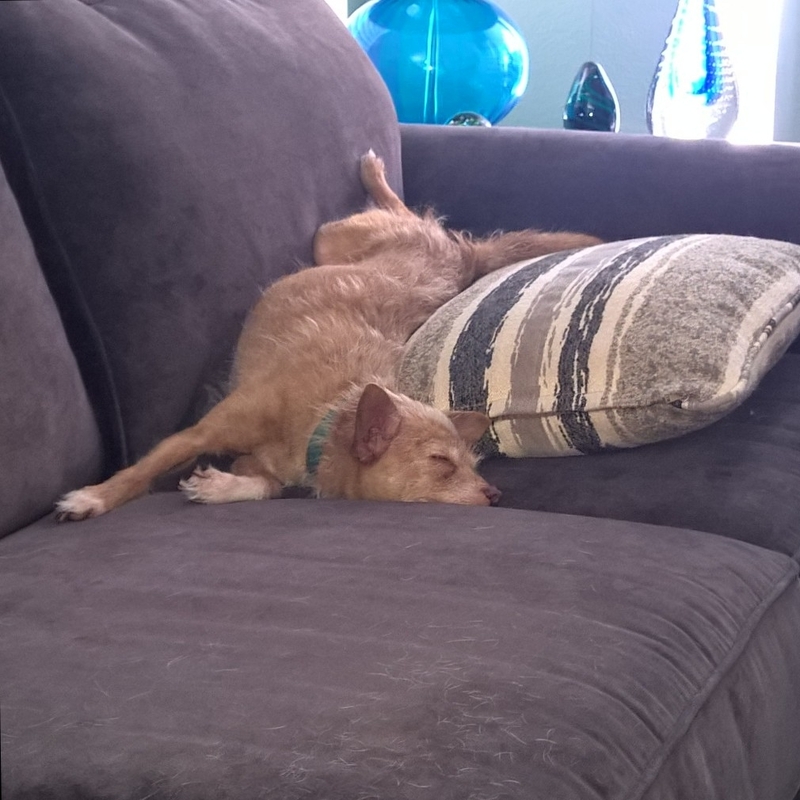 Her mom was a full apricot toy poodle, and dad was half Italian greyhound, half chihuahua. So she had French, Italian, and Mexican in her. That still brings a smile to my face. Zoe (named after the Doctor Who character by my hubby), loved to run. That Italian Greyhound in her. And she is/was just the sweetest darned dog ever. But she has the annoying habit of shredding any ‘potty pad’ that she is left in a room with, and whining constantly to get up in the morning. Never could break her of that habit. Anyhow, in the past 3 months, her quality of life has gone downhill fast. Before that, we all used to joke, ‘are you sure she’s this old?’, because she was still so lively. Although about a year ago, she started having pooping accidents at night. She was sleeping downstairs at the time, alone, because that way she didn’t whine in the morning. (yes, daddy has always spoiled all of his girls.) Because you couldn’t leave her with a potty pad, hubby started laying out cheap bath towels for her. That worked. He dealt with the clean up. She also started struggling to get up and get going in the morning, particularly cooler ones. We attributed that to arthritis and age, and hubby just wouldn’t force her to take that early walk, and would just walk her a little later in the morning once she got going. (he works from home 4 days a week.) If you can’t already tell, she has daddy wrapped around her little paw. That’s kind of the problem now. We had had ‘the talk’ when she was about 10, about how far we would go, financially, for any of the dogs (we have 3) as they got older, and agreed on that. We didn’t have the talk about what symptoms would indicate it’s time for an elderly dog to be ‘let go.’ The unspoken was that it would be some obvious sign. But now, we are here at that time. In the past 3 months, she started throwing up several times a week. This past weekend, I found 2 containers in the fridge that were a mix of white rice, carrots, and chicken. I knew but asked anyway, ‘what’s with the big containers in the fridge?’ Hubby admitted that Zoe hadn’t eaten her (regular, dog food that is the kind made for elderly dogs) for 2 days; he was moving her to this food mixture he had made. (fortunately, it’s worked. She’s eating again and not throwing up, so far.) She’s always been very lean (the Italian greyhound in her), but now she feels like skin and bones. Her back legs occasionally will just shake, almost like shivering, sometimes when she stands up. He now carries her up and down the stairs. Sometimes, if she’s moving fast, or turning a corner, her back legs slip out from under her and she kind of stumbles. He doesn’t force her on the 4 long walks a day he takes the dogs on. (he admitted that recently, as soon as she’s done her business, she is DONE. Before, she was the front dog on all walks.) (he just takes her to the grass outside our unit for each trip now, alone.) She sleeps so deeply sometimes now, that you have to check to see if she’s still breathing. Every morning he’s now in the habit of half-joking when he opens their door (she no longer stays alone downstairs, because I was smelling something foul about 6 weeks ago, and decided she’s doing something to cause the foul smell, so she’s upstairs in the room with the other 2 dogs.) He says, “Zoe, you are still with us!” (or Zoe, you made it another day.) But our hearts are hurting. She doesn’t play with the chihuahua any more like she used to. She doesn’t play with toys. She’s mostly sleeping, even more than dogs normally do. She isn’t in any apparent pain, but she doesn’t enjoy life anymore, either. Don’t get me wrong. I love Zoe too. Although she’s always had a habit of throwing me the stink eye occasionally. (I kid not.) But that’s because I’m daddy’s ‘bad cop’ in the house with the dogs. Just the rolls we have ‘parenting’ three little dogs. Daddy’s the good cop, mommy is the Enforcer. But I feel bad. For both Zoe, and especially for my husband. I know he still hopes she’ll give a definitive ‘sign’, (or just pass naturally on her own)…but I hate to have her circumstances degrade much further, but I can’t force this on hubby or back him into a corner on it. This entry was posted in Uncategorized and tagged dogs, pets, quality of life, Zoe on July 11, 2018 by Silver Willow. What a difficult decision! Bless you guys. Just bigs hugs to all three of you. I love his tender heart. Ah, my heart goes out to you. Men seem to struggle with this more than we do. We seem to be able to love and let go while men love and want to hang on – I went through this with my husband and one of our cats – it was heartbreaking for me to watch the two of them struggle so. Zoe has had such a wonderful life. Hugs! he is amazing, special, for sure. Thanks! Thanks for understanding. Sorry you had to deal with this too. ahh…just hold her and love her. Sounds like she has lived a full life but what a tough decision you both are facing. Your husband will get there if suffering increases for Zoe. I would be inclined to just let her pass naturally as long as she isn't in pain. Going through this stage in a dogs life is the hardest on us humans who love them. That's one reason I don't have a dog any longer. When my last two dogs left me, I decided I just couldn't go through that pain again. I have a really good friend who is going through it right now. She lost her beloved dog 3 months ago but is still feeling it. Good luck! thanks, Laurie. Sorry you had to go through this recently. She's not in pain, but she's struggling, and not enjoying life. I see it. He doesn't. But thanks. Wouldn't want to be you right now. Worse yet would be to be in your husband's shoes. Everyone of us who has had pets have to deal with this. Yes, it is sad and one of the hardest decisions to make, but you do know when it is time. We know when we pick out that adorable little puppy that this day will come. Nature just didn't give dogs a proper lifespan. I have been there with Mighty Dog at 17 and I can only say, the day will come when your husband will know the time has come. It just happens. Oh no, this is a difficult time, you have to do what's best for Zoe. I am so sorry. At some point my husband said “NO MORE PETS” simply because they don't live as long as their humans. I am quite convinced, and it gives me a great deal of comfort, that he is animal heaven with all the pets he loved so very deeply. I'm in tears just reading this. I can only image how difficult it is for all of you. This is a really heartbreaking decision. I'm sure your husband knows it's time but letting go is painful. My guess is he'll come around for Zoe's sake. You're in for some hard, sad times and I really feel for you. I think almost everyone who has loved a pet has faced that “when is the right time” decision. And I wish we had the options for people as we do for pets, to see the suffering and know it is irreversible and be able to say a loving goodbye on our own terms.I think all you can do is love Zoe and do whatever you can to make things easier or more comfortable and appreciate that kind, good man who has such a big loving heart — and whom, I think, will one day soon say, “today is the day.”My dear vet says, “they tell you when it is time to let them go.” I think she'll know how to communicate that to him. I hope so. Meanwhile, big hugs to you. very much so. Thanks, Cheryl! I feel awful for both of them. I've always had dogs, but none lasted this long, and all had very clear cut signs or issues. Not this 'shades of gray' stuff. I'm sure. It's just unfortunate that we aren't simpatico on this. But I completely defer to him on it. It's always sad. They give us such unconditional love. Thanks, Christine. I just wish we saw eye to eye on this. But I'll continue to follow his wishes. Gosh, I haven't been THAT bad. It's not like I've had cancer or some other terminal disease.but thanks. Oh Martha. :: hugs :: I hope he does. It's just hard, because I know in my heart Zoe isn't enjoying life anymore. She of course loves us, but… but I can't force him. Jeanie, I've had dogs my whole life, so yes, I've faced the decision many times. This was / is our first pet together. I hope you are right. and thanks. I'm so sorry about all this. I've been in this situation with pets too many times, and sadly, I've had to be The Strong One to make that final decision which is Best For Everyone. It's all terribly difficult. We all have to let our loved furry ones go way too soon. I am glad Hubby is having plenty of time with Zoe. So very sad. You all have my sympathy. Thanks, Nance. It's never easy, for sure. So sad to read this post (a bit late). Letting go of family, friends, and furry friends is always so sad. They are all part of our extended family. I too hope all goes peacefully and falling asleep in the best way. Sorry, I seem to have missed seeing this post.Nothing makes this time any easier. We 'give our hearts to a dog to tear', as Kipling says. I have been there a few times, you have my sincere sympathy. Tough times for sure. The kids just had their (step family) dog put down. Just as well that they far away on holiday. awwww. As rough as it is on us, it's even rougher with children in the immediate family.